Meet Your Farmer…and Buy Their Food! People in the Lehigh Valley are passionate about the “good food movement” (a phrase we learned recently and will add to our lexicon). So passionate that they braved icy temperatures Monday night to come to the Nurture Nature Center‘s “Meet Your Farmer” event — organized by Lynn Prior of Buy Fresh By Local of the Greater Lehigh Valley — to talk about the process of getting locally grown foods from farms to farmers’ markets and restaurants. The standing room only crowd spent an hour listening to a three person panel discuss the challenges and benefits of the farm-to-table movement, and then got a chance to sample some locally grown delicacies. The panel included Bolete chef Lee Chizmar, Berks County farmer Tim Stack, and Andrew Puglia, procurement manager of the Common Market food hub in Philadelphia. The event gave us a lot to digest, but we want to start with community supported agriculture, or CSA. CSAs, farm shares, and buying clubs are all ways for you to get fresh, locally grown food directly from a farmer. There are 19 of them in and around the Lehigh Valley. With a CSA, you’re basically subscribing to a farm. You buy a membership in the farm before the season begins, and get a box of seasonal produce each week during the growing season. The keyword here is seasonal, meaning now is the time to sign up. Most farm shares, CSAs and buying clubs operate from around June through October and November, allowing you to get the produce (or in some cases, meat, eggs and dairy products) you want each week straight from the farm. The Rodale Institute, one of our partners in the Lehigh Valley Food Policy Council, has a farm share program that operates on a pay-as-you-go basis. Visit their website to sign up. Buy Fresh Buy Local of the Greater Lehigh Valley has more information on the difference between CSAs, farm shares and buying clubs, as well as a list of local operations. The demand for local food is growing. Stack, who owns Eckerton Hill Farm in Berks County, says he couldn’t have made a living on just selling locally 20 years ago. Now, he grows over 200 varieties of fruits and vegetables, including 100 kinds of heirloom tomato (The farm’s website bills them as “The Tomato People.”) Not bad for a business that has its roots in a rooftop garden. The supply is there too, and there’s room for even more growth. Even in the dead of winter, Bolete is able to have seasonal produce from seven local farms on its menu, and Chizmar says he could always use more. Puglia said Common Market is looking for everything from kale to strawberries. If you’re a local farmer, Common Market wants to work with you, but that doesn’t mean they take just any farm. Puglia wants to try to sign up as many Lehigh Valley farms as he can to provide healthy, locally grown foods to Sodexo. But there are certain factors he’s looking for: consistency of product, the ability to deliver (literally, as in driving your food in on a truck), and the ability to produce enough for institutional use. He’s also looking at farms that have gotten GAP (Good Agricultural Practices) certification or are at least considering/on their way to getting it. It was a satisfying discussion, and there’s still a lot more to talk about. If you want to get involved in the conversation, join us Monday, March 30 for another Lehigh Valley Food Policy Council lunch/discussion on growing our local food economy. This event will explore starting and scaling up food and beverage businesses as well as a look at the possibilities of commercial kitchen incubators. Join us for a locally sourced lunch and the ongoing discussion from noon to 2 p.m. at the Fowler Center, 511 E. 3rd St., Bethlehem. Click here to reserve your spot. The RenewLV February Newsletter Is Here! We know this looks tiny in your browser, but click on the images to get a better, closer look at our February newsletter. 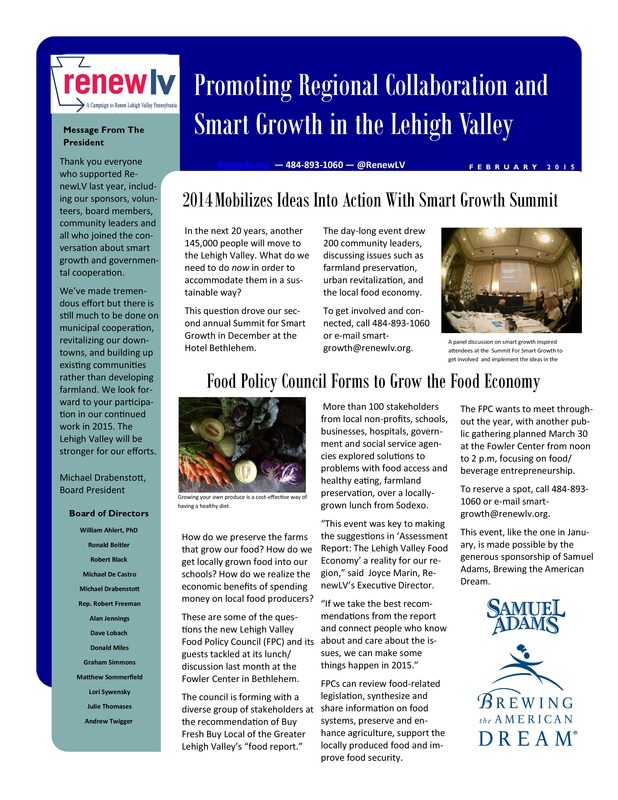 Just recently, RenewLV, together with the newly forming Lehigh Valley Food Policy Council, and the support of Samuel Adams, Brewing the American Dream, organized a meeting discussing growing the local food economy of the Lehigh Valley. Stakeholders with the food policy council include United Way of the Greater Lehigh Valley, Second Harvest Food Bank, Rodale Institute, Buy Fresh Buy Local of the Greater Lehigh Valley, CACLV, the Counties of Northampton and Lehigh, St. Luke’s Hospital, The Nurture Nature Center, Sacred Heart Hospital, Lafayette College, Jordan Heights Neighborhood Revitalization, Seven Generations Charter School and RenewLV. With the EnvisionLV’s Assessment Report: Lehigh Valley Local Food Economy talking food being a focal point of sustainability efforts in the region, the discussion from this event was crucial to bring the area’s residents together to talk about “moving from ideas to actions” and what the next steps are in this process. 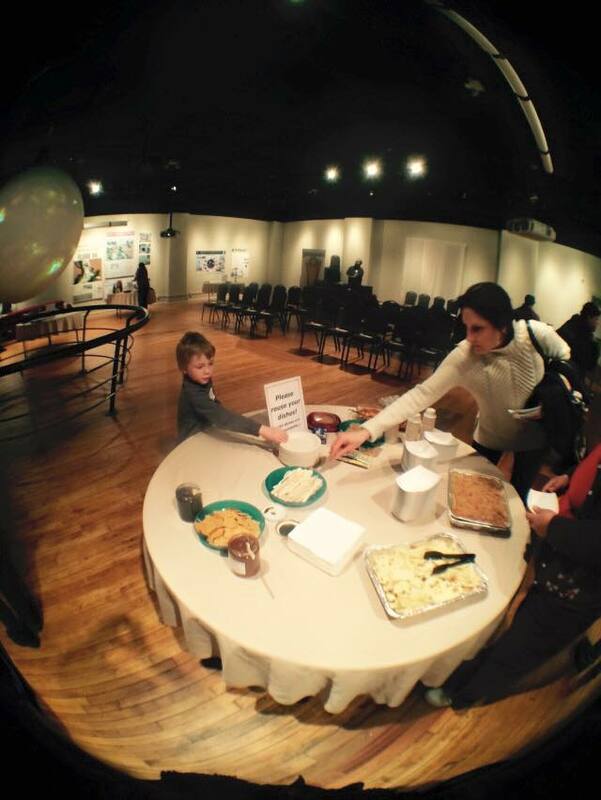 So how does the local food movement contribute to smart growth for the Lehigh Valley? According to a report by the Leopold Center for Sustainable Agriculture, the average truck travels over 1,500 miles to bring food to conventional supermarkets. If we were able to reduce the number of trucks that traverse America to bring us our food, we would lower carbon emissions. This would create cleaner air for our area’s residents. Also, our food system would become increasingly more sustainable and resilient against changes in oil prices and vulnerability to weather events. At the Summit for Smart Growth this past December, an important point that many community leaders (including Lower Macungie Township Commissioner Ron Beitler) said it’s wrong to look at farmland as undeveloped land, a blank canvas for a “real” use. Rather, we need to look at farmland as a legitimate use of land. It is a use that puts less strain on our community than industrial, commercial and residential uses because it requires fewer roads, less infrastructure and no schools. The agricultural land in the Lehigh Valley is fertile land, and if it remains in the production of food can bring us independence, self-reliance and food security. In the Lehigh Valley we see a trend of taking agricultural land and paving it over for warehouses that provide few and relatively low paying jobs. This economic development strategy takes large amounts of land and strains the tax base due to the increased infrastructure needs, usually being paid for by taxpayers. Doesn’t this sound crazy to you? For most people including myself, more often than not we go to the supermarket and pick up apples from Washington State, carrots picked in California, potatoes grown in Idaho, bread made from Midwestern wheat. We usually don’t give any thought to how the food was grown or where it came from. People supporting Urban Agriculture, growing their own and their neighbor’s food. We take it all for granted and do not realize how much work has gone into growing our food. One of the benefits the local food movement brings to our area is the opportunity for people to experience what it is like to grow their own food and gain an appreciation for what they eat. Another benefit of supporting a local food economy is improved health. Most of the food Americans eat is not very good for us. It is highly processed food with many artificial ingredients. Smart growth strives to create human-scaled cities for people and to preserve the open space around them. By living in a walkable neighborhood and walking or biking to meet your daily needs, we experience physical activity without trying. That can only help you so much if you are eating fast food every day. 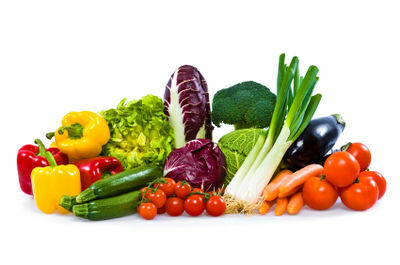 Locally grown food, unprocessed and in its natural state, is great for the human body. By eating what we grow or what is grown in our region, we naturally eat healthier food that improves our physical health. 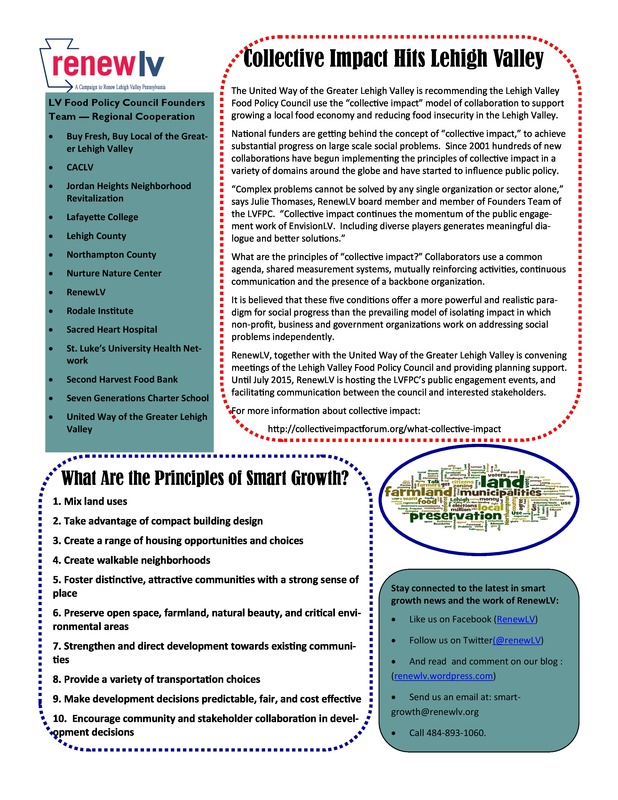 The creation of the Lehigh Valley Food Policy Council is significant. 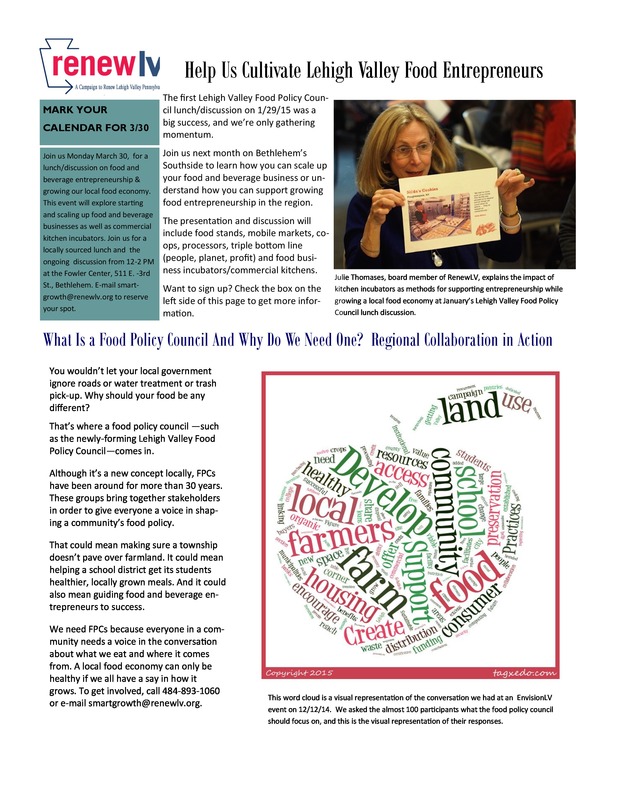 By working to bring the ideas in “the food report” to fruition, our local food movement will continue to grow, supporting farmland remaining farmland and using it to feed our residents. Growing a local food economy supports smart growth in the Lehigh Valley and helps us to preserve the sustainability of the region. We create a healthier region and planet when we rekindle the importance of locally grown food. 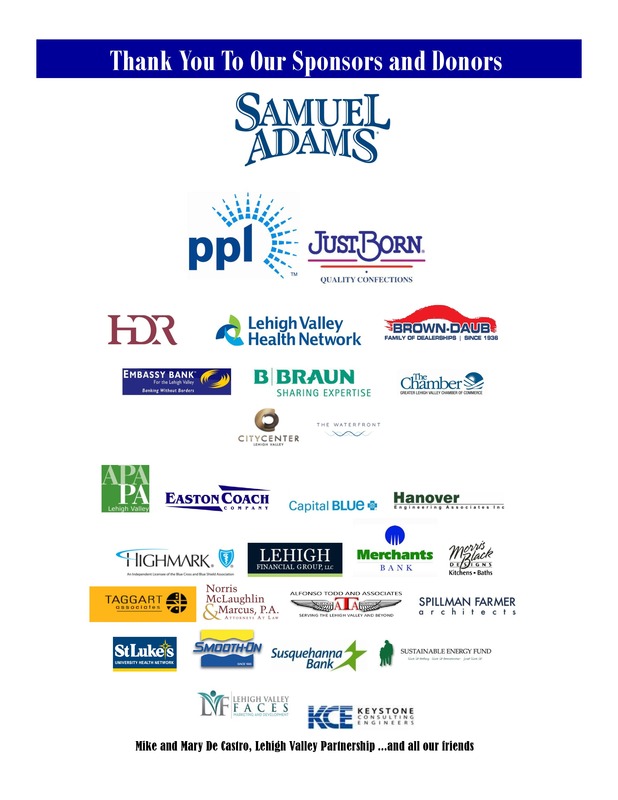 This will continue to benefit the Lehigh Valley for years to come. Just recently, Lower Macungie Township announced that they were pursuing install bike lanes along Hamilton Blvd when it is repaved later in the year. So the question now is how do bike lanes contribute to smart growth in the Lehigh Valley? With plans for the lanes to be near the Hamilton Crossings Shopping Center, this will provide another transportation option for people to get there. What will be needed along with the lanes leading to the shopping center though is bike lanes in the shopping center along with bike parking which may seem hard to do, but as seen in this article, the Dutch have accomplished this in their suburbs too. When thinking of the influence on climate that carbon emissions from cars has, taking these baby steps of getting cars off the road through bike lanes is a practical way to help fight climate chance. Something that is not noted often is how the number one killer of people ages 1 to 44 is motor vehicle accidents. Therefore, if we want to decrease the number of deaths that we see among our neighbors, the best thing we can do is create places where we don’t have to drive if we don’t want to. Bike lanes gives people the opportunity to use a mode of transportation that is not as deadly. And even more so, bike lanes helps to contribute to a road diet by repurposing the extra wide travel lane space for cars which thereby creates a street that is designed for traffic to move at slower speeds. From healthier lungs to better mental health to lower stress, these are only a few examples of the health benefits of cycling as compiled by PeopleforBikes. Because Hamilton Boulevard is a state owned route, the township has to obtain approval from PennDOT in order install the bikes lanes. Now one might ask why this is an issue? Well, when looking at smart growth, PennDOT values moving car traffic quickly over creating safe streets for people. This can be seen practically a few years ago in Lower Macungie when the residents of the village of East Texas and the Lower Macungie township commissioners both supported lowering the speed limit on Willow Ln./East Texas Rd. to match it’s character as more of a town center. Now you would think that it would be passed unanimously with this kind of support, but PennDOT actually decided to ignore it altogether. Therefore the outcome of this decision has long term effects on if bike lanes will be built on the Lehigh Valley’s state owned roads in the future. If it is approved by PennDOT, it will be a large victory for Lower Macungie township in trying to work towards smart growth. Smart growth is not easy to accomplish, but Lower Macungie working towards bike lanes is the start of a radical transformation of a township that has had enough with urban sprawl. So the question I want to leave you all with is if you are willing to add space on the streets of your community for bike, to help and work towards smart growth? And even more so, what kind of Lehigh Valley do you want to live in?